I've been using computers socially since 1992, chatting on and sysopping local dial-up BBSes (ahhh the good ol' days!). We definitely had our share of people faking details of their lives, and because of that I think I've always looked at online personas with an ultra-skeptical eye. I read the notes and looked at the photos Dave Cicirelli posted and thought, "Really? People believed that?!" And inwardly, I scoffed at them. But then I reminded myself: Facebook is a different sort of community from the old BBSes and modern day message boards. If I were truly honest with myself, how much would I be willing to believe if someone I already knew in "real life," a friend, was posting fake details about his/her life? Would I recognize the embellished stories? Would I spot the Photoshopped images and cry foul? 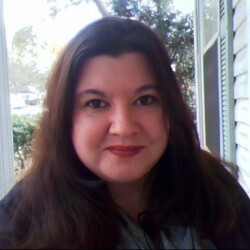 Or would I rationalize away any suspicions, because I "know" (or a friend knows) this person? Questions like this are exactly what Cicirelli ends up exploring in his wild and crazy 6-month hoax. He ponders the way friendships have changed since Facebook, especially for younger adults, for whom it has always been a presence. Cicirelli delves into these ideas as they surface during the course of his experiment. He is never once preachy, and he's quick to acknowledge when he's made assumptions or snap judgments. Best of all, unlike so many that have contemplated the impact of social media on our relationships, Cicirelli offers a balanced and hopeful outlook. Cicirelli maintains a relaxed, conversational style throughout. His narrative is interspersed with clips from his "Fakebook" wall and accompanying photos. There is a mystery that pops up early on, and the solution to that was completely unexpected! I actually searched back through the book to see if I should have known, if I'd missed something. 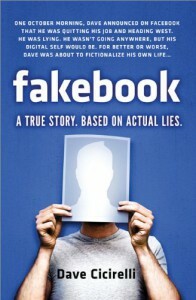 Fakebook is light and funny, with plenty of points to consider at a deeper level. I thoroughly enjoyed reading it, and will be mulling it over for weeks to come.